The knowledge of the structure function relationship of the allergen is essential to design allergenic variants with reduced IgE binding capacity but intact T cell reactivity. Asp f 2 is a major allergen from the fungus Aspergillus fumigatus and >90% of A. fumigatus-sensitized individuals displayed IgE binding to Asp f 2. In the present study, we evaluated the involvement of C-terminal cysteine residues in IgE binding conformation of Asp f 2. The deletion mutants were constructed by adding three C-terminal cysteines of the native Asp f 2 one at a time to the non-IgE binding Asp f 2 (68–203). The point mutants of Asp f 2 (68–268) with C204A and C257A substitutions were constructed to study the role of C-terminal cysteines in IgE binding. Immunological evaluation of reduced and alkylated Asp f 2 and its mutants were conducted to determine the contribution of free sulfhydryl groups as well as the disulfide bonds in allergen Ab interaction. Four-fold increase in IgE Ab binding of Asp f 2 (68–267) compared with Asp f 2 (68–266) and complete loss in IgE binding of C204A mutant of Asp f 2 (68–268) indicate the involvement of C204 and C267 in IgE binding conformation of Asp f 2. A significant reduction in IgE binding of wild and mutated Asp f 2 after reduction and alkylation emphasizes the importance of cysteine disulfide bonds in epitope Ab interaction. The hypoallergenic variants may be explored further to develop safe immunotherapeutic strategy for allergic disorders. Immediate hypersensitivity reactions in allergic patients result in the production of IgE against various protein allergens. The mediators released as a result of allergen-induced cross-linking of IgE Abs on mast cell and basophil receptors are mainly responsible for the clinical symptoms of type 1 allergy. The structural analysis of allergens is of utmost importance because only a small number of Ags are allergens and the characteristic structural features of these proteins are essential in giving rise to symptoms in allergic disorders (1). Among various inhalant allergens, fungal spores are universally recovered both indoors and outdoors and are recognized as an important cause of respiratory allergy (2, 3, 4, 5). Asp f 2, a model protein used in this study, is the major allergen from Aspergillus fumigatus (Af)3 (1, 2, 3, 6, 7, 8, 9). More than 90% of Af-sensitized individuals displayed IgE binding to Asp f 2. Our previous study on structure function relationship of Asp f 2 demonstrated the presence of continuous as well as discontinuous IgE binding epitopes in Asp f 2 (10). The immunologic evaluation of Asp f 2 using overlapping synthetic peptides revealed the presence of nine IgE binding epitopes varying in length from 3–7 aa. The study also revealed that either −N- or −C-terminal region of the protein is essential for allergen IgE interaction since the recombinant construct without −N- and −C-terminal regions failed to bind the IgE Ab. Incorporation of either of the terminal regions of Asp f 2 to the same construct resulted in regaining the IgE Ab binding capacity. As the identification of the structural entities on the allergen molecule that interact with IgE Ab is an essential prerequisite for the development of effective therapeutic strategies, we have investigated further the role of cysteine residues of Asp f 2 in allergen IgE interaction. The primary structure analysis of Asp f 2 revealed the presence of eight cysteine residues throughout the molecule. To study the involvement of cysteine residues in the secondary structure as well as in IgE binding of Asp f 2, we devised a number of deletion and point mutants by manipulating various cysteine residues especially near the C-terminal region of the protein. Several mutants were constructed by adding C-terminal sequences including three C-terminal cysteines C204, C257, and C267 one at a time to the non-IgE binding recombinant construct Asp f 2 68–203(68–203) to evaluate the contribution of these residues in the conformational epitope of Asp f 2. The distinct differences in IgE binding of Asp f 2 68–266(68–266) and Asp f 2 68–267(68–267) identified C267 as an essential amino acid for Asp f 2 Ab interaction. The immunologic evaluation of point mutants of Asp f 2 68–268(68–268) at C204A and C257A also indicated the involvement of C204 in IgE binding with sera from Asperigillus-sensitized patients. Moreover, immunologic evaluation of reduced and alkylated Asp f 2 and its mutants suggest that disulfide bonds between certain cysteine residues may be critical for allergen IgE interaction. Three groups of subjects were included in this study. Serum samples (n = 10) from patients with allergic bronchopulmonary aspergillosis (ABPA) were collected at the Allergy-Immunology Clinics of Medical College of Wisconsin affiliated Hospitals (Milwaukee, WI) and Allergy-Immunology Clinic of Northwestern University Medical School (Chicago, IL). These patients fulfilled the criteria for ABPA as described by Rosenberg et al. (11, 12). The serum samples from 10 patients with asthma and skin prick test positivity to a mixture of Aspergillus extracts but without clinical features of ABPA, as well as 10 normal subjects, were also used in this study. The institutional review committee approved the human study. To express the recombinant constructs in prokaryotic system along with C-terminal His tags, the PCR-amplified products carrying various gene fragments were cloned and expressed in pET 23 (b+) vector as previously described (9). The primers used for the PCR amplification of deletion mutants and the complete Asp f 2 were shown in Table I⇓. The recombinant constructs were affinity purified using Ni2+-nitrilotriacetic acid agarose column. The purified proteins were analyzed on SDS-PAGE and stained with Coomassie brilliant blue R250 as previously described (6). The gene encoding the extreme N-terminal sequences (67 aa) and C-terminal sequences (81 aa) of Asp f 2 were expressed as recombinant fusion proteins in pMALc2 vector. The primers were designed with ECOR1/HindI11 restriction sites at 5′ and 3′ ends of Asp f 2 1–67(1–67) and ECOR1/PST 1 restriction sites at 5′ and 3′ ends of Asp f 2 188–268(188–268) as shown in Table I⇑. Escharichia coli (TB1) was transformed with pMALc2 vectors with or without inserts. The recombinant Asp f 2 constructs expressed along with MBPs were affinity purified using amylose resin. The protein bound to amylose resin was eluted using 10 mM maltose and maltose-binding protein (MBP) without the fusion component was used as a control in ELISA (13). Two point mutants of Asp f 2 68–268(68–268) with C204A and C257A were prepared using the QuikChange site directed mutagenesis kit from Stratagene (Stratagene, La Jolla, CA). The plasmids isolated from the colonies were subjected to automatic DNA sequencing. All the colonies exhibited incorporation of alanine in place of cysteine at their respective positions. The clones with mutated gene fragments were overexpressed in pET system using the same protocol as described above (9). The binding of specific IgE and IgG Ab from the sera of Asperigillus-sensitized patients and normal controls to various deletion and point mutants of Asp f 2 was analyzed by an indirect ELISA (7). To study the structural similarities between various recombinant constructs and Asp f 2, an ELISA inhibition study was conducted using pooled serum samples from patients with ABPA. 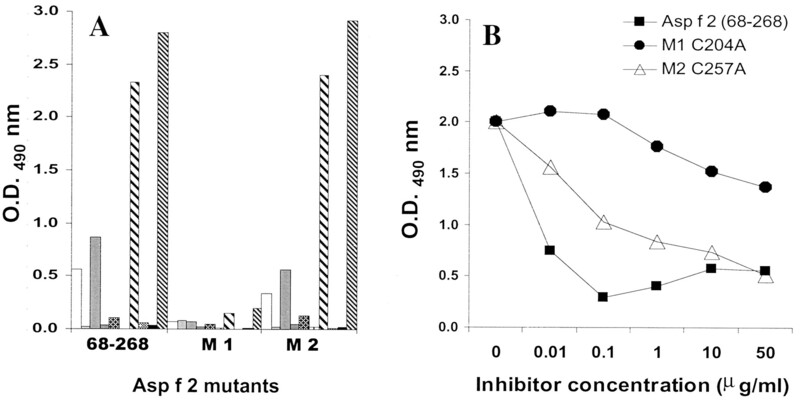 The serum samples were diluted 1/10 and incubated with decreasing concentrations of 50 μg to 10 ng of different deletion and point mutants of Asp f 2. The preincubated samples were centrifuged and added to the washed and blocked Asp f 2-coated plates. Further steps in the assay were conducted with reagents as described before (10). The dose-dependent decrease in Ab titer of preincubated serum was determined from the ELISA absorbance values in comparison with uninhibited serum. 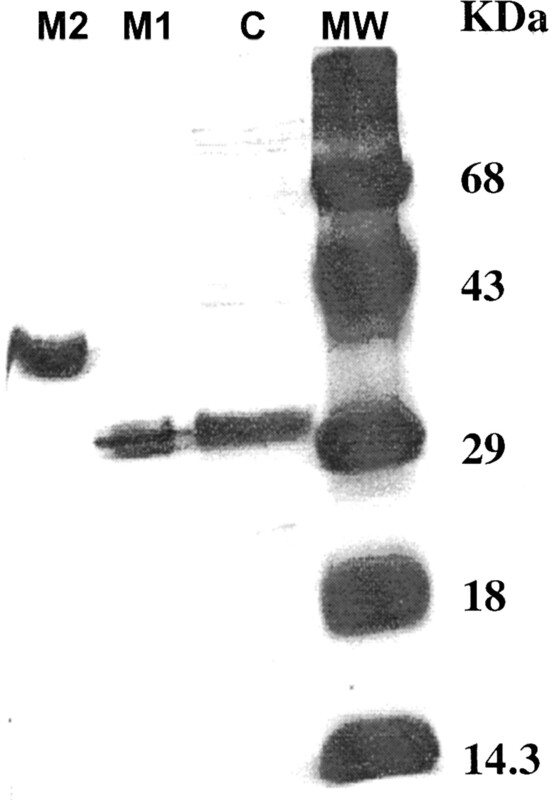 Purified recombinant constructs (5 μg/lane) were resolved on 15% SDS-PAGE gel (7, 14). The resolved proteins were stained with Coomassie brilliant blue R250. 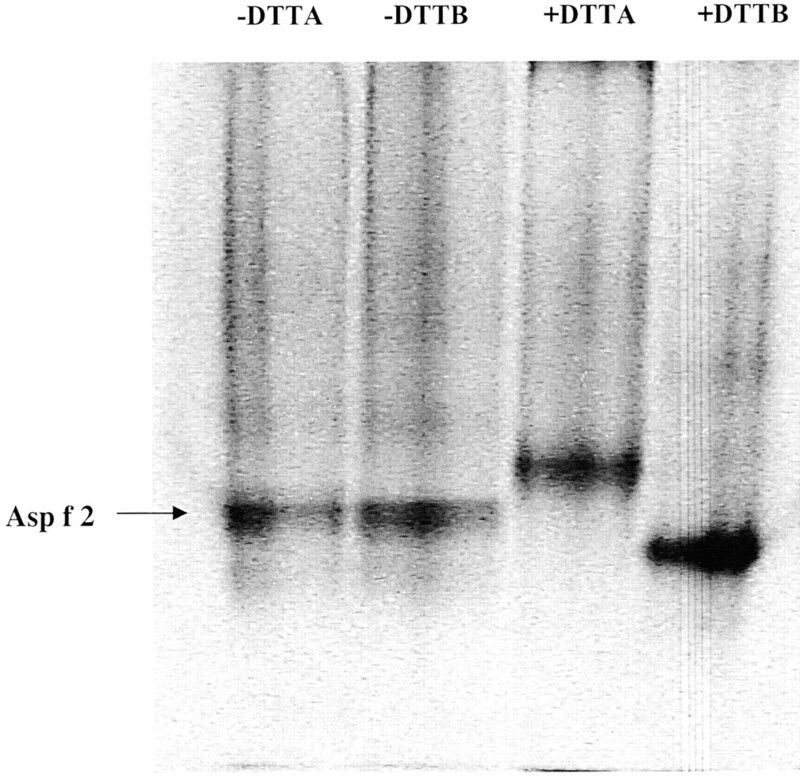 The SDS-PAGE-separated proteins were then transferred on to nitrocellulose membrane (Schleicher and Schuell, Keene, NH) by using transblot apparatus (Bio-Rad, Hercules, CA) as previously described (14). After blocking, the membranes were incubated separately with pooled sera from patients with ABPA, patients with allergic asthma, and normal subjects at a dilution of 1/10 in blocking buffer. After overnight incubation at 4°C, the strips were treated with biotinylated goat anti-human IgE (1/1000) and incubated for 1 h. The addition of streptavidin peroxidase and color development was conducted as previously described (14). A quantitative estimation of Kd was conducted as described previously (15). Briefly, ELISA plates were coated with different concentrations (1 nM to 5 μM) of Asp f 2 and its various mutants in PBS (pH 7.4) overnight at 4°C. After blocking with 1% BSA in PBS, pooled serum sample from patients with ABPA (1/25) was added to the plates and incubated for 3 h at room temperature. 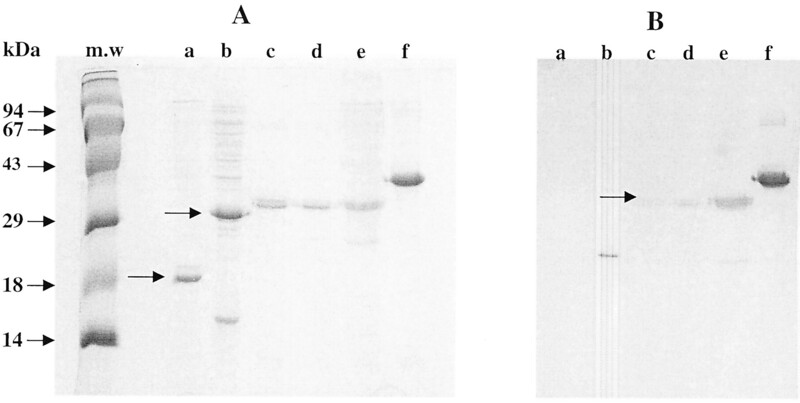 The following procedures of addition of biotinylated anti-IgE Ab and detection of Ag-specific Abs in the plate using streptavidin peroxidase were the same as mentioned above. The resulting absorbance values at 490 nm were used to determine the Ab-bound fraction ν. Using Klotz equation, a plot of 1/ν and 1/(Ag)t was obtained where ν was the fraction of Ab that was bound and (Ag)t was the total Ag concentration (15). Kd values were determined from the slope of the plot. To study the involvement of free cysteines and the disulfide bond between two cysteines in IgE Ab binding, wild protein and the mutants were first denatured with 8 M urea to expose all the free sulfhydryl (SH) groups and disulfide bonds buried within the protein for further reactions. A set of denatured samples were then subjected to reduction using 20 mM DTT as described previously (16). The denatured samples without DTT treatment were designated as (−DTT) samples and after DTT treatment as (+DTT) samples. For modifying the thiol groups that were available in (−DTT) and (+DTT) samples, these were treated separately with 250 mM iodoacetamide and iodoacetic acid as detailed elsewhere (16). The modified protein samples were then resolved in a nondenaturing gel and visualized by the differences in the mobility of iodoacetic acid and iodoacetamide-treated samples. The (−DTT) and (+DTT) samples were then evaluated further for their IgE Ab binding using ELISA (9). The mean OD values of Ag Ab reactions by ELISA using serum samples from two different subject groups were compared with those of the control group by using Student’s t test (two-tailed independent samples) with Statworks program (Cricket Software, Philadelphia, PA). Values for ABPA, asthma, and control groups were compared and p < 0.05 was taken as significant. To study the involvement of eight cysteine residues of Asp f 2 in IgE epitope interaction, a series of deletion mutants of Asp f 2 were cloned and expressed either in pET 23 b+ or pMalc2 vector. The reason for using two different expression systems was that the smaller constructs such as Asp f 2 1–67(1–67) and Asp f 2 188–268(188–268) could only be expressed properly in frame along with MBP as the fusion counterpart using pMalc2 vector. The Asp f 2 constructs of sizes varying from 14–37 kDa could be expressed as stable proteins in pET expression system without any fusion components. Fig. 1⇓, A and B describes the different constructs that were used in this study. Schematic representation of various deletion and point mutants of Asp f 2 generated by site-directed mutagenesis. To determine whether various fragments were capable of binding to IgE, a solid-phase ELISA was carried using 10 individual sera from patients with ABPA. As shown in Fig. 2⇓A, fragment Asp f 2 68–203(68–203) without C14, C204, CC257, and C267 failed to show IgE Ab binding. However, Asp f 2 1–203(1–203) with an additional C14 at the N-terminal region and Asp f 2 68–268(68–268) with the remaining C-terminal cysteine residues, C204, C257, and C267 exhibited IgE Ab binding comparable to the full-length allergen Asp f 2 1–268(1–268). The mean ELISA IgE absorbance (OD490) for Asp f 2 1–203(1–203) and Asp f 2 68–268(68–268) was 0.688 ± 0.776 and 0.610 ± 0.826, respectively, compared with 1.42 ± 1.43 for Asp f 2 1–268(1–268). However, sera from patients with asthma and normal controls failed to show significant IgE binding with Asp f 2 and its mutants by ELISA (data not shown). IgE reactivity of 10 individual sera from ABPA patients with recombinant Asp f 2 and variants as analyzed by indirect ELISA. A, Complete Asp f 2 (1–268) and polypeptides Asp f 2 (1–203) without C-terminal cysteines, Asp f 2 (68–203) without N- and C-terminal cysteines, and Asp f 2 (68–268) devoid of N-terminal cysteine. All these mutants were expressed along with C-terminal His tag and purified by Ni2+ affinity chromatography. B, N-terminal deletion mutant Asp f 2 (1–67) and C-terminal mutant Asp f 2 (188–268). These proteins were expressed along with MBP as fusion proteins. MBP-coated wells failed to show binding with sera from patients, indicating IgE binding of the fusion proteins were due to the Af counterparts. c, Deletion mutants of Asp f 2 encompassing various C-terminal cysteine residues and expressed in pET (23b+) vector along with His tag at the C-terminal ends. d, The mean IgE Ab binding of Asp f 2 and recombinant constructs with sera from patients with ABPA and normal controls were subjected to statistical evaluation and p values were indicated. To determine whether C14 alone or the three C-terminal cysteines C204, C257, and C267 together could provide the essential conformation of IgE Ab binding, we designed two small fragments, Asp f 2 1–67(1–67) with C14 and Asp f 2 188–268(188–268) with all the three C-terminal cysteines. The IgE Ab binding of these constructs with sera from 10 ABPA patients are shown in Fig. 2⇑B. 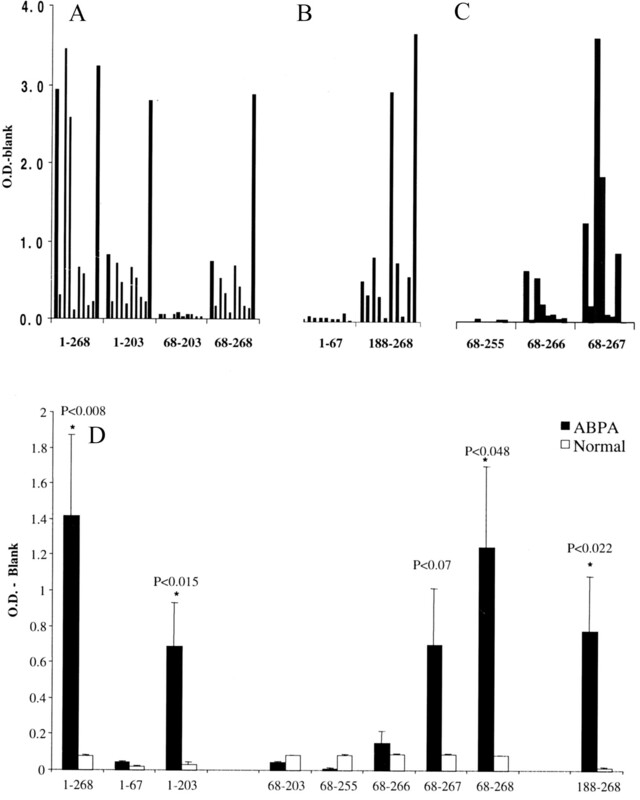 Of the two fragments, only Asp f 2 188–268(188–268) exhibited ELISA results comparable to the mature allergen, whereas Asp f 2 1–67(1–67) failed to show IgE Ab binding with ABPA sera. The mean ELISA absorbance for Asp f 2 188–268(188–268) was 0.778 ± 0.963 compared with 0.934 ± 0.615 for the full-length allergen. This finding clearly indicates that certain conformation or the tertiary structure of the allergen is essential for the allergen IgE Ab interaction. In contrast, IgG Ab binding of the various deletion and point mutants of Asp f 2 were comparable with the native allergen, indicating that cysteine residues were not involved in epitope IgG interaction. To define the specificity of epitope Ab interaction near the C-terminal region of Asp f 2, we devised three more constructs by incorporating the remaining three cysteines at the C-terminal region, C204, C257, and C267 one at a time to Asp f 2 68–203(68–203) as described above. The IgE Ab binding of various deletion mutants Asp f 2 68–255(68–255), Asp f 2 68–266(68–266), and Asp f 2 68–267(68–267) with serum samples from 10 patients with ABPA are shown in Fig. 2⇑C. Deletion mutant Asp f 2 68–255(68–255) with five cysteines at the C-terminal region failed to show IgE binding. A marked difference was noticed in IgE binding of the deletion mutants Asp f 2 68–266(68–266) and Asp f 2 68–267(68–267); addition of only one amino acid, C267, resulted in a 4-fold increase in IgE binding, indicating the involvement of C267 in Asp f 2 Ab interaction. The statistical significance of IgE Ab binding of Asp f 2 and its recombinant constructs with sera from ABPA patients were compared with the Ab binding with normal subjects Fig. 2⇑D. The values of p < 0.008 for Asp f 2 and among other IgE binding C-terminal fragments, Asp f 2 68–268(68–268) and Asp f 2 188–268(188–268), exhibited values of p < 0.048 and p < 0.022, respectively. Dissociation constant Kd IgE Ab interaction with Asp f 2 as determined by ELISA was 0.044 + 0.003 μM. The Kd values 0.04 + 0.004 and 0.027 + 0.0007 μM for Asp f 2 68–268(68–268) and C257A mutant of Asp f 2 68–268(68–268), respectively, were also comparable with the complete allergen (data not shown). 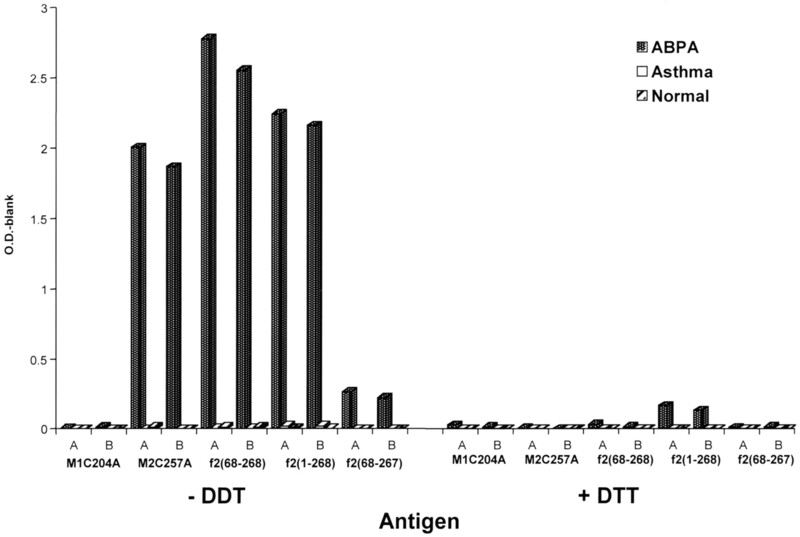 The IgE binding of these mutants under denaturing condition as determined by immunoblots using pooled sera from patients with ABPA was shown in Fig. 3⇓. The mutants and the complete allergen exhibited some reactivity under denatured condition in Western blots. As seen in ELISA, the fragments Asp f 2 68–203(68–203) and Asp f 2 68–255(68–255) failed to show IgE binding in blots, whereas there was gradual increase in IgE binding from fragment Asp f 2 68–266(68–266) to Asp f 2 68–268(68–268). A, SDS-PAGE profile of purified recombinant wild-type Asp f 2 and variants. Samples were loaded as molecular mass marker (m.w. ), a, Asp f 2 (68–203); b, Asp f 2 (68–255); c, Asp f 2 (68–266); d, Asp f 2 (68–267); e, Asp f 2 (68–268); and f, Asp f 2 (1–268). B, Western blots of the same group of mutants as indicated above with pooled serum (sera from 10 patients) from ABPA patients. Arrows indicate the reactivity for the expressed proteins. Further analysis of the conformational similarity among various recombinant constructs was conducted by competitive ELISA inhibition assay (Fig. 4⇓). Pooled serum from patients preincubated with various concentrations of deletion mutants were evaluated for IgE binding to recombinant Asp f 2. No inhibition of IgE Ab binding to Asp f 2 was observed with serum samples incubated with Asp f 2 68–203(68–203) and Asp f 2 68–255(68–255). In contrast, Asp f 2 68–266(68–266) exhibited 30% inhibition in IgE binding compared with 56% inhibition by Asp f 2 68–267(68–267). Interestingly, the addition of single cysteine residue at C267 imparted a conformation more comparable to the complete Asp f 2 molecule. Hence, indirect ELISA and competitive inhibition ELISA emphasizes the importance of C267 in proper folding and conformation of the allergen Asp f 2. Inhibition of IgE binding to solid phase-coated complete Asp f 2 using the cysteine mutants. A pooled serum (n = 10) from ABPA patients was preincubated with different amounts of recombinant Asp f 2 and various deletion mutants as indicated in the figure. Preincubated serum samples as well as sample without Ag incubation were transferred to rAsp f 2-coated wells and bound IgE was analyzed by indirect ELISA. To define the involvement of C204 and C257 individually in IgE Ab binding, we constructed two point mutants of Asp f 2 68–268(68–268) by replacing C204 and C257 with alanine. The mutant Asp f 2 68–268(68–268) with C204A exhibited the same molecular size as Asp f 2 68–268(68–268) in the range of 29 kDa, whereas mutant Asp f 2 68–268(68–268) with A257C demonstrated a molecular size of 35 kDa (Fig. 5⇓). On reducing gel, C257A mutant exhibited a size almost 5–6 kDa higher than that of Asp f 2 68–268(68–268). When both the mutants were evaluated for IgE binding with sera from 10 individual ABPA patients, the mutant A204C exhibited complete loss in IgE-binding activity. The mutant C257A exhibited an ELISA absorbance of 0.648 ± 1.08 compared with 0.681 ± 1.036 for Asp f 2 68–268(68–268) as shown in Fig. 6⇓A. This result indicates that C204 is essential for the allergen IgE interaction, whereas removal of C257 failed to show any reduction in IgE Ab binding. 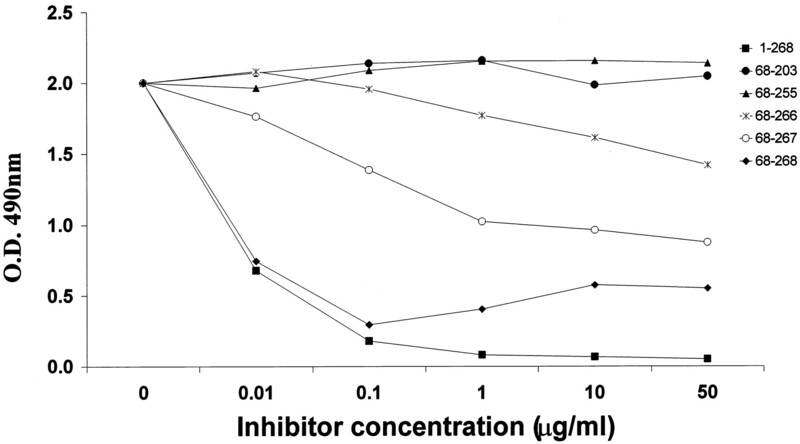 Akin to the results obtained in indirect ELISA, competitive inhibition ELISA exhibited 74% inhibition in IgE binding by C257A of the solid phase coated with Asp f 2 68–268(68–268) as shown in Fig. 6⇓B, whereas A204C failed to show significant inhibition in IgE binding. SDS-PAGE analysis of purified recombinant point mutants of Asp f 2 (68–268). MW, molecular mass markers; C, recombinant Asp f 2 (68–268); M1, point mutant of Asp f 2 (68–268) with C204A; M2, point mutant of Asp f 2 (68–268) with C257A. A, IgE reactivity of 10 individual sera from patients with ABPA with recombinant Asp f 2 (68–268) and the point mutants C204A and C257A. B, Inhibition of IgE binding to solid phase-coated recombinant Asp f 2 (68–268) by point mutants C204A and C257A of Asp f 2 (68–268) using pooled serum (n = 10) from ABPA patients. To address the issues of whether the free −SH groups of these cysteine residues or a particular conformational constraint due to disulfide bond formation between the cysteine residues were essential for Ab allergen interaction, we conducted a series of biochemical and immunologic analyses of Asp f 2 and its mutants. Asp f 2 (−DTT samples) when subjected to −SH modification with iodoactamide and iodoacetic acid failed to show any difference in the mobility in gel (Fig. 7⇓). However, Asp f 2 (+DTT samples) on similar alkylation exhibited distinct differences in mobility in the gel confirming the presence of free −SH groups in the reduced protein. In indirect ELISA, Asp f 2 (−DTT samples) exhibited strong IgE binding with sera from patients with ABPA, and the mean ELISA absorbance value (OD490, 2.20) was comparable with absorbance for native Asp f 2 (OD490, 2.427) as shown in Fig. 8⇓. In contrast, alkylated Asp f 2 (+DTT samples) failed to show significant IgE Ab binding with almost 20-fold reduction in absorbance compared with the native Asp f 2 and Asp f 2 (−DTT samples). Among the Asp f 2 mutants included in this study, Asp f 2 68–267(68–267) and the point mutant C257A of Asp f 2 68–268(68–268) also exhibited similar reactivity after denaturation and reduction with DTT as the native Asp f 2 (Fig. 8⇓). A significant loss in IgE Ab binding of the Asp f 2 and its mutants after reduction and alkylation reaffirmed the critical role of cysteine disulfide bonds in allergenicity of Asp f 2. Electrophoretic mobility of Asp f 2 molecules with carboxymethyl modification of the free −SH groups in a nondenaturing gel with discontinuous buffer system (16 ). −DTTA, urea denatured Asp f 2 after neutral iodoacetamide treatment; −DTTB, urea denatured Asp f 2 after iodoacetate treatment; +DTTA, urea denatured and DTT reduced Asp f 2 after iodoactamide treatment; and +DTTB, urea denatured and DTT reduced Asp f 2 after iodoacetate treatment. IgE reactivity of 10 individual sera from ABPA, allergic asthmatics, and control subjects with recombinant Asp f 2 and its mutants after denaturation, reduction, and free thiol group modification. The −DTT samples were only denatured without further reduction with DTT, whereas +DTT samples were denatured and subjected to reduction. Each sample thereafter was subjected to A, iodoacetamide treatment and B, iodoacetic acid treatment. In the present study, we describe the involvement of cysteine residues of allergen Asp f 2 in IgE Ab binding with sera from Af-sensitized patients. We have selected Asp f 2 as a model allergen because it is a well-characterized major fungal allergen and binds to IgE Ab from 90% of Af-sensitized patients, especially patients with ABPA. The aim of this study is to define the structure function relationships of Asp f 2 and to generate hypoallergenic variants that may be useful in safer diagnosis and in immunotherapeutic regimens which could replace the commonly used less-defined allergen extracts. Three-dimensional structure of Asp f 2 has not been known yet; however, the molecular cloning and sequencing has revealed the presence of eight cysteine residues throughout the molecule (9, 10). Asp f 2, when denatured with 8 M urea to expose the free thiol groups (if any) present in the native protein and further treated with thiol group modifying agents such as iodoacetic acid and iodoacetamide, failed to show any modification, thereby suggesting that all eight cysteines of Asp f 2 were present in disulfide bonds and no free thiol group was available or exposed to surface even after denaturation. At the same time, denatured proteins on alklylation with iodoacetic acid and iodoacetamide exhibited similar IgE binding as the native protein in ELISA. These two findings together suggest that free thiol groups may not be involved in the conformational epitopes of Asp f 2. In contrast, contribution of intrachain disulfide bonds between cysteine residues of Asp f 2 in IgE Ab binding was evident by significant loss in IgE binding of denatured as well as reduced allergen protein. Akin to this finding, several earlier studies have reported that cysteine residues with sulfydryl groups in their side chains are involved in interchain or intrachain disulfide bond formation, and hence often play a crucial role in protein folding and conformation (17, 18). However, the IgE Ab binding of denatured and reduced Asp f 2 and its mutants in Western blots could be due to the residual Ab binding conformation remaining in the protein because of the incomplete denaturation and reduction, or due to the interaction of IgE Abs with epitopes involving amino acids other than cysteines. The involvement of intrachain disulfide bonds in IgE binding has recently been reported for major allergens from different sources (19). Disulfide binds between cysteines in close proximity are predicted to be on the protein surface and hence available for Ab binding, whereas disulfide bonds between nonlocal cysteine residues appear to be involved in stabilizing the protein molecules (19, 20, 21). A recent study by Smith et al. (20) demonstrated that a small loop between C73-C78 is mainly involved in conformational epitope of Der p 2, since disruption of this disulfide bond resulted in complete loss of IgE Ab binding of the allergen. In a similar study on another mite allergen Lep d 2, the disulfide bond between C72-C77 appeared to be mainly involved in IgE allergen interaction (23). In our study, the IgE binding of the fragment Asp f 2 188–268(188–268) with C204, C257, and C267 indicate that intrachain disulfide loops between cysteine residues residing in close proximity might be involved in conformational epitopes of Asp f 2. Similar conformational constraints in IgE Ab binding was observed near the N-terminal region of Asp f 2. 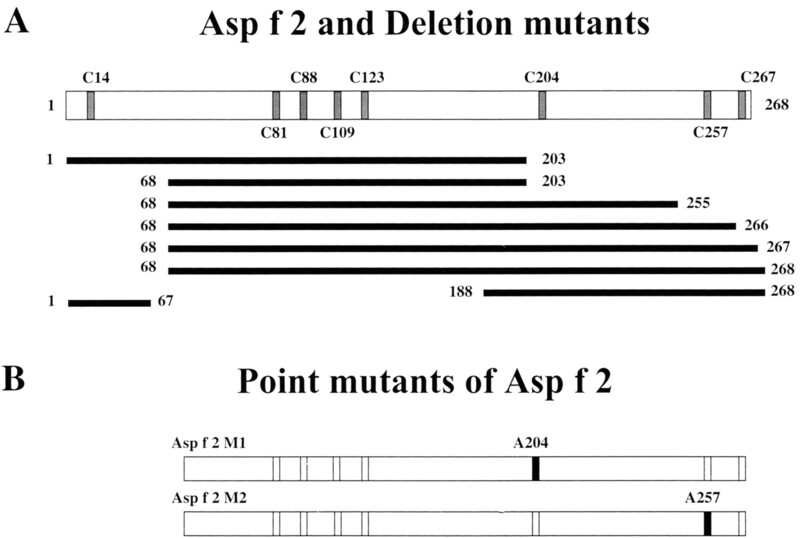 Deletion mutants Asp f 2 1–67(1–67) and Asp f 2 68–203(68–203) failed to show IgE Ab binding, while the mutant Asp f 2 1–203(1–203) encompassing five N-terminal cysteine residues exhibited comparable IgE binding with the complete Asp f 2 allergen. In contrast, deletion of cysteine residues residing far apart within the molecule such as in Asp f 3, another Af allergen, failed to contribute significantly in IgE binding. This indicates that small loops between cysteine residues within the allergen are probably involved in epitope paratope interactions (our unpublished observations). To precisely delineate the role of these three individual cysteine residues in the allergen IgE interaction, our main approach was to construct various deletion mutants of Asp f 2 by incorporating one cysteine at a time in the fragment of Asp f 2 68–203(68–203). A high IgE binding of Asp f 2 68–267(68–267) compared with Asp f 2 68–266(68–266) indicated the direct involvement of C267 in the conformational constraints of Asp f 2. However, at this point, the involvement of C204 and C257 in conjunction with C267 in IgE Ab binding was not clearly defined. Hence, in the next set of experiments, two point mutants were constructed to examine whether C267 alone is sufficient to impart the proper conformation for IgE binding or C204 and C257 are also involved in the context of C267 for allergen IgE interaction. Of the two point mutants Asp f 2 68–268(68–268) with alanine substitution, C204A and C257A, respectively, mutant C204A failed to show IgE binding with patient’s sera, indicating that C204 along with C267 are essential for IgE Ab binding of Asp f 2. The involvement of disulfide bonds in IgE Ab binding of Asp f 2 as evidenced from the reactivity of DTT-treated protein also raises the possibility that C204 and C267 are engaged in disulfide bond in native allergen. Interestingly, the point mutant C257A with comparable IgE binding as the wild construct exhibited an increase in molecular mass of 5–6 kDa in SDS-PAGE. As we used reducing gel, the size difference could be either due to the aggregation of the protein in gel or due to the formation of incorrect disulfide bond in the mutated protein (22). The role of cysteine residues in IgE Ab binding was also reported for a number of pollen allergens (23). Immunological evaluation of various deletion mutants of a major pollen allergen Par j 1 demonstrated that cysteine residues at positions 14 and 29 were essential for IgE binding of the protein. In fact, high-resolution crystal structure studies have shown that the bond between cysteine 14 and 29 is one of the four essential covalent bonds conserved among several homologous lipid transfer proteins from plant (24). In contrast, studies conducted on various allergens from different sources indicated that the involvement of cysteine disulfide bonds in Ab binding are restricted only to certain allergens based on their primary and secondary structures. As in the case of major ragweed allergens Amb t 5 and Amb a 5, the contribution of individual amino acids in Ab binding is evident by the antigenic noncross-reactivity of these structurally similar allergens. These two allergens with 45% sequence identity, conserved cysteine residues, and similar β-sheet and α-helical structures carry distinct Ab-binding epitopes, represented mainly by nonconserved amino acids of the allergen (25, 26). Similarly, for Timothy grass pollen allergen Phl p 5 b, the allergenic variant generated by incorporating a cysteine residue near the N-terminal region of the protein in addition to the wild-type cysteine residue present near the C-terminal region failed to affect the IgE binding of the allergen, indicating that the disulfide bond formation does not contribute to the IgE-binding property of Phl p 5b (27). In summary, this study demonstrates the contribution of cysteine residues as well as the conformational constraints due to disulfide bonds between cysteine residues to the allergenicity of Asp f 2. In addition, almost 100-fold reduction in IgE binding of recombinant fragment Asp f 2 68–203(68–203) and point mutant C204A suggests that targeted substitution or deletion (cysteine or other surface-exposed amino acids) could result in nonanaphylactic allergenic variants which may in turn be useful for safer immunotherapy. In our recent study using T cell clones generated from ABPA patients, immunodominant T cell epitopes were identified near the N-terminal region of the allergen which were distinct from IgE-binding epitopes (28). Therefore, the hypoallergenic variants of Asp f 2 generated and characterized in this study may be explored further in place of T cell peptides as multiple T cell epitopes with different MHC restrictions to be recognized by a number of patients as mode of therapeutic strategy. We thank Drs. Vasanthi Jayaraman and Kalpana Chakraburtty for valuable suggestion and critical reading of the manuscript. We gratefully acknowledge the technical assistance of Nancy Elms, Laura Castillo, and Puspanita Naik, and the editorial assistance of Donna Schrubbe. ↵1 This investigation was supported in part by grants from National Institutes of Health (no. AI 42349), the US Veterans Affairs Medical Research Service, and an Ernest S. Bazley grant to Northwestern Memorial Hospital and Northwestern University. ↵3 Abbreviations used in this paper: Af, Aspergillus fumigatus; ABPA, allergic bronchopulmonary aspergillosis; MBP, maltose-binding protein; SH, sulfhydryl. Friguet, B., L. Djavadi-Ohaniance, M. E. Goldberg. 1997. Immunochemical analysis of protein conformation. T. E. Creighton, ed. Protein Structure 323 Oxford University Press, New York. Hollecker, M.. 1997. Counting integral numbers of residues by chemical modification. T. E. Creighton, ed. Protein Structure 151 Oxford University Press, New York.